As you read the history below, you'll see that St. David's is unique in being the only Bronx Episcopal church founded by a black priest. The location has never been a black community, but we remained in the area and are happy to say that today, 124 years later, we have a diverse congregation and welcome all to our parish family. We tell this story of our beginnings, not because we are stuck in the "good old days" but by remembering those who went before us, we are grateful and encouraged by their determination and faith. 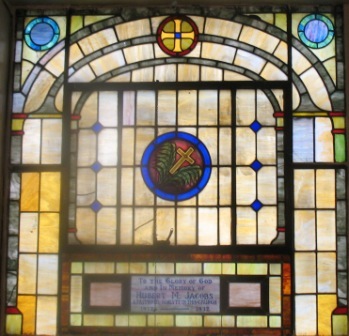 St. David’s Episcopal Church was founded in 1895 by a Black Priest, the Rev. Dr. Edward G. Clifton, out of his concern that the Black people in the community had no place to worship. Dr. Clifton was particularly concerned about the Dining Car Waiters and Pullman Porters who roomed in the area of the New York Central Railroad Depot, which was located under the Melrose Building at 161st Street and Morris Avenue. Dr. Clifton was authorized by the Bishop of New York, the Right Reverend Henry Codman Potter, to start a Mission in the Bronx. He met with several people in February 1895 on the Feast of the Purification of the Blessed Virgin Mary. This small group gathered in the homes of various members on Elton Avenue until they were able to rent a hall on Courtlandt Avenue and 149th Street. The Archdeacon of the Bronx, the Ven. Dr. Charles C. Tiffany, personally gave the money to purchase two lots for the building of a church at its present location on 160th Street. It is said that the wife of Borough President Bruckner gave money for one of the lots. The undercroft was built and the cornerstone laid in 1903. The congregation began to worship there. In 1920 and 1921 the upper part of the church was built. It was designed by Vertner W. Tandy (1885-1949) the first Black architect registered in the State of New York. Writing in 1922, George Freeman Bragg, Jr., in his History of the Afro-American Group of the Episcopal Church, stated that the communicants numbered some 724. Dr. Clifton continued to serve until 1927. In 1928 the Rev. Dr. Arthur G. Best succeeded Dr. Clifton as Priest-in-Charge. During his time, St. David’s was blessed with gifted singers and musicians, under the direction of Professor Packer Ramsey, a noted Basso Soloist; Organists Viola Wilkinson, Tomlin Anderson and Isaac Riley. Dr. Best served until his retirement in 1957. The Rev. John W. Wells was appointed Priest-in-Charge in 1958. Fr. Wells was a Chaplain at Rockland State Hospital and thus encouraged the Parishioners’ interest in serving as volunteers in the Children’s Division. Fr. Wells and his wife, Winifred, opened their home on weekends to some of the youth from the hospital. Several Parishioners developed one-on-one relationships with the youngsters. They were taken to the movies, on shopping trips and given parties, picnics and special attention. In addition, the volunteers went to the Hospital at least once a week. Fr. Wells was also a Chaplain at New York University. He was instrumental in getting students to tutor the youth after school. Several of the boys who attended St. David’s were able to take advantage of the ABC Program wherein they attended prestigious Prep Schools and went on to Ivy League Colleges. The Melrose Private School was started in St. David’s and remained there for a few years. Fr. Wells’s Chaplaincy was later transferred to Bronx Psychiatric Center where the Chapel is named for him. The Rev. John G. Murdock succeeded Fr. Wells in 1975, and served at St. David’s until his death in 1979. A multi-vocational Priest, Fr. Murdock held positions in health and hospital administration in New York City and later in Albany. Much of the Parish’s introduction to the Trial Prayer Book was under Fr. Murdock’s leadership. During the relatively short time that he was at St. David’s, Fr. Murdock’s love for the liturgy of the Episcopal Church, the spoken word, and all kinds of music was apparent. It was during Fr. Wells and Fr. Murdock’s time that the Bronx began to undergo change; the area where the Parish is located was referred to as the South Bronx and received a nation-wide notoriety as a symbol of urban decay. This was the beginning of very difficult times, but the people of St. David’s continued, encouraged by the faith and perseverance of those who had gone before them. In 1980, the Rev. Bertram G. Bennett, Jr., came to St. David’s. Under his leadership, St. David’s, located in what had now become the poorest congressional district in the United States, strives to live out the Diocese’s mission objective of being “an effective church presence in a poor community” and has increased its efforts in outreach and evangelism to its community. Throughout its history, St. David’s has always been involved in outreach, but because of the changes taking place in the community, new programs were added in response to the growing needs. As the problems in the South Bronx continued, St. David’s and other Episcopal Churches joined South Bronx Churches (SBC). St. David’s has been a member of SBC (an affiliate of Industrial Areas Foundation) since its inception in 1987. SBC is an ecumenical organization with a broad-based agenda that includes issues dealing with education, housing, employment, drug-free environments, and health. Fr. Bennett is the Chair of SBC’s Housing Task Force, and the Parish has been actively involved in SBC’s endeavors since its formation. We thank God for giving us the opportunity to serve in this part of His vineyard since 1895 and look forward to continuing to make a difference in the years ahead.